U.S. Sen. Kamala Harris will be campaigning for Democrats in California this weekend — the first time she's hit the trail at home since before the June primary. But that doesn't mean Harris isn't playing a key role in this year's midterm election: Harris has been hopscotching all over the Midwest and South, campaigning for Democrats, as she apparently gears up for a 2020 presidential run. In recent weeks, California's junior senator has made stops in Florida, to campaign for the Democratic Senate and gubernatorial candidates there; in Iowa, where she campaigned for midterm candidates and talked frankly about sexual harassment with female supporters who praised her performance at the Brett Kavanaugh hearings; and in Wisconsin, Ohio and South Carolina. In Georgia, she gave an impassioned speech at Spelman College, a black women's university, that seemed to lay out the themes she plans to hit on the campaign trail. Harris has also raised $2.4 million for Democrats this cycle — more than any other senator — and she's been funneling money to Democratic parties in some of those states she recently visited. So what do all those states have in common? They're early primary or caucus states, and ones Harris would need to lock up to secure the Democratic nomination in 2020. It's also worth noting that she has a biographical book coming out early next year, and has been touting her proposed tax break for working families, which would stand to benefit many voters in those states that weigh in early on presidential contests. 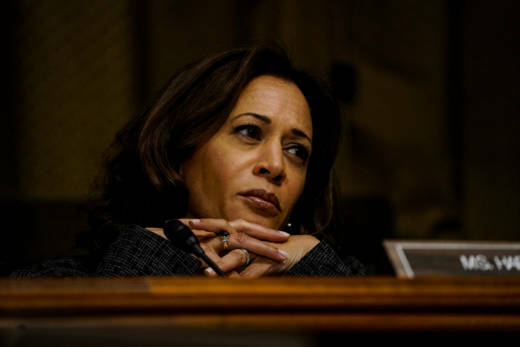 Harris could also benefit from the California primary, which was recently moved up to March from June when it's likely to have more of an impact on the outcome of the nominating process. She could have company out on the hustings from one or two other Californians who are also testing the presidential waters: Los Angeles Mayor Eric Garcetti and billionaire political activist Tom Steyer. Harris, of course, is still playing coy when asked about her next move. Harris spokeswoman Lily Adams said the senator is "dedicating all her waking moments" to electing Democrats next Tuesday. "What she's said is that her number-one political priority is to elect Democrats up and down the ticket in 2018," said Adams. "She is 100 percent focused on that for the next week, and then after that, she will take a look at it."